Beebombs to help bring the bees back. Handmade in Dorset, Beebombs are a mix of 18 British wildflower seeds, fine, sifted soil and locally sourced clay. 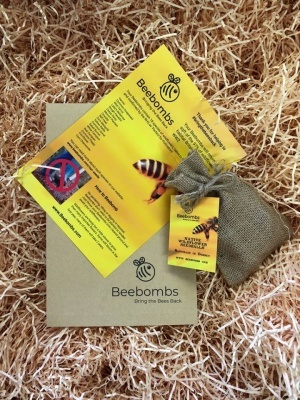 These native species seeds are designated by the Royal Horticultural Society as "Perfect for Pollinators"
Beebombs to help bring back the bees. 97% of natural bee and butterfly habitat has been lost in the UK since WW2. With your help, we can start to restore the lost wildflower habitat and make an important contribution to the biodiversity of Great Britain. What and why are Beebombs? 97% of native British Wildflower habitat has been lost since World War 2. Wildflower habitats are where bees and butterflies make their lives. This is serious for Britain. Serious for you and serious for your children. Biodiversity is crucial for many reasons and wildflowers are crucial to biodiversity. 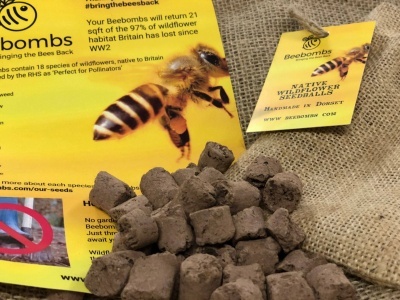 With Beebombs you can re-create these lost habitats and help bring back the bees. Handmade in Dorset, UK. The seedballs are made from sheltering local clay and sifted compost, packed with a range of native wildflower species' seeds. 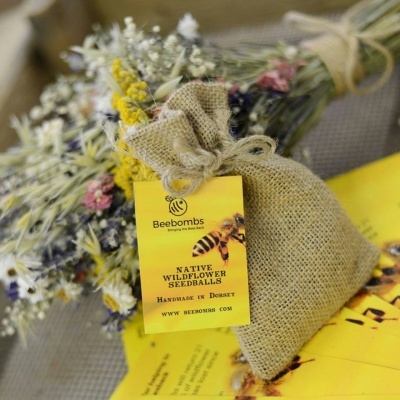 Almost all of the seeds are on the Royal Horticultural Society's 'Perfect for Pollinators' list. The seeds you get will create an aesthetically beautiful and a wildlife enticing garden. Once scattered, you don't need to water or tend your Beebombs. I tend to say 'cleared ground' as wildflowers are hardy and adaptable but slow growers. This means that they can be out-competed by faster-growing grasses and perennial weeds at the critical early stages, so straight onto soil is best if possible. Lots of sun and rain is, of course, important, as is time. Beebombs use only sustainable packaging. No 'one use plastics' used. Handmade in Dorset, UK.